Fee: $75.00 Lunch will be served 12:30 – 1:30. 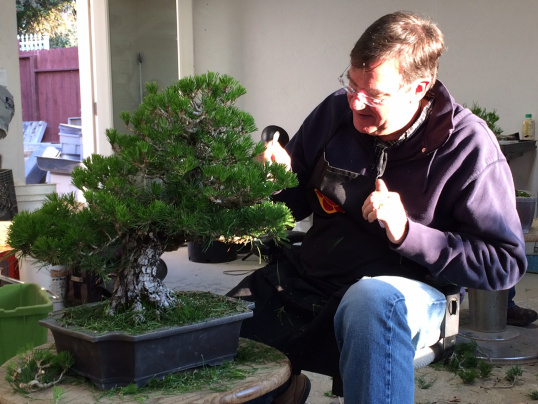 In this class, the student will learn how to defoliate Japanese Black Pine with a goal of increasing ramification (more branches), and develop shorter needles. Needle pulling techniques will be taught to achieve overall balance, and prepare the tree for back budding. The student will learn the “decandling” techniques now used to create the highest quality bonsai in Japan. This is the summer work done to refine and balance the growth of the tree. If time permits, the student will learn wiring techniques and how to develop branch structure that will develop pads of foliage. Other Pine varieties may be worked on as well.